City / Town: Shahpur Hillock, 2 Miles away to north of "Great Black Walls" of Bijapur. Bijapur shareef is the sand of greatest Awliya ALLAH of their time and Sayyad Sadaths in Karnataka. There are more than 10,000 AwliyaALLAH buried in Bijapur and near by places belonging to different orders of Silsilas like Chistia, Qadiria, Shuttaria, Haidaria, Naqshabandia, Soharwardia and etc.. Notably, Hazrth khwaja Ameenuddin Ali allha shere khudaChisty rahmatulla is one the greatest sufi saints of Chisty Order and comes on the top order of peer-o-murshids of Hazrath Khwaja Mehboob Ali Shah Chisty Al-Ma'roof Hazrath Khwaja Lalu Bhai Qasir Chisty (RA), M.R. Pallaya, Bangalore in the Shijrah Mubarak of Silsil-e-Chistiya. Hazrath Khwaja Lalu Bhai Qasir Chisty ( Khwaja-e-Bangalore, M.R Pallaya, Bangalore ) has personally visited all the Dargahs of great Sufi saints of Silsila-e-Chistiya and of entire India and of abroad only by walk starting from Khwaja-e-Khwajagaan, Hazrath Khwaja Moin-uddin Chisty (Hindal Vali Atta-e-Rasool Sal-lal-lahu Alaihi wa Sallam). After seeing them with his own eyes, he has narrated the Muqhams of these Awliyahs in his Arifana Kalams. Thus, the greatness of Hazrath Khwaja Amin Uddin Ali A'la Sher-E-Khuda Chisty (RA) is also mentioned in some of the greatest kalams namely "Aye Chisth Ke Waali" "Kashf ke Maali" "Bisht Ke Jajmain". All these great kalams are read and recited from the past for more than hundred years during Chatti Shareef Fatiha which is held during 6th moon of every Urdhu / Arabic month as well as in Majlis in the Dargah shareef of Hazrath Khwaja-e-Bangalore (RA). The main Chatti Shareef which is celebrated during 6th moon of every Rajab month in this Dargah Shareef is very famous in whole Bangalore itself. 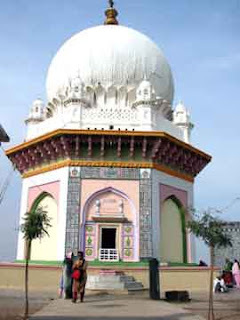 URS-E-SHAREEF :- The Urs-e-Mubarak of Hazrath Khwaja Ameen Uddin Ali (RA) A'la Sher-e-Khuda Chisty is very famous and popular in the entire Karnataka State. The new posters designed urs posters are in a beautiful colours and patterns which are circulated in all the cities of south india. The shrine of the great Sufi, Hazrath Khwaja Ameen Uddin Ali (RA) Aala Sher-e-Khuda Chisty (RA), lies on the Shahpur hillock, two miles to the North of the great black walls of Bijapur, the most beautiful of medieval city states of the Indian Deccan. The people who cannot afford medical treatment sometimes change of place and the spiritual atmosphere of the shrines will help them. Rather than suffering at home they come here. Other people with the same problems are here so they are not alone. And sometimes - just occasionally - Karamaths (Divinely Miracles) are witnessed here because Hazrath Khwaja Ameen Uddin Ali Chisty (RA) is very powerful in such cases. Both Hindus and Muslims find help here and revere him greatly." There was a Hindu pilgrim from near Mysore who used to visit the Dargah often because Hazrath Khwaja Ameen Uddin Ali A'la Sher-e-Khuda Chisty (RA) saved his child and he narrates the incidents as quoted below. "When our boy was an infant he became very ill," said the man. "No medicines from any doctor helped. We tried everything, but our son only got weaker. Then some neighbors said we should come here. We were desperate, so we got on a bus and brought the boy straight to the shrine. One of the pirs [guardians] cured him in a second. What could not be done in twelve months he did in a minute." "The child was sick, and he was made right," said his wife. "So now we believe. Each year we come back to thank the Khwaja Saheb [ Hazrath Khwaja Ameen Uddin Ali Chsity (RA)], and to bring him our problems. Every year our wishes are fulfilled." "Hazrath Khwaja Ameen Uddin Ali Chisty 'Ala Sher-e-Khuda' (RA) is still here," said her husband. "Many people see him in the crowd." "Its true," said his wife. 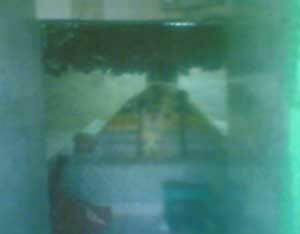 "Some see him sitting on his tomb, dressed in a white robe with an orange turban and a green scarf. Others see him walking around his shrine. To others still he appears in dreams. "It depends on the intensity of your devotion," said the man. "But Hazrath Khwaja Ameen Uddin Ali Chisty (RA) looks after every one of his followers." Hazrath Khwaja Ameen Uddin Ali Chisty (RA) lived in the early seventeenth century, Bijapur's Golden Age, when the city became a beacon of tolerance and learning that attracted scholars, artists and mystics from across India and the Middle East. Relations between Hindus and Muslims had always been easier in the Deccan than in the more polarised North, and it had long been a Deccani tradition that every Muslim sultan should have a Hindu Chief Minister. But during the lifetime of the Hazrath Khwaja Ameen Uddin Ali Chisty (RA), under the rule of Sultan Ibrahim Adil Shah II, that tradition of tolerance and syncretism reached an astonishing climax. This atmosphere of languid, courtly free thinking is reflected in the Bijapur School of miniatures which underwent its Renaissance under Ibrahim's patronage. In these wonderful otherworldly Images, water drips from fountains as courtesans as voluptuous as the nudes of South Indian stone sculpture attend bejewelled princes. There is a sense of timelessness and calm, of quiet abandon to the joys of love, qawwali and poetry. The holy tomb of Hazrath Khwaja Ameen Uddin Ali Chisty (RA) - an exquisite jewel box of a building - lies within a low walled enclosure just beyond the black bastions of the Adil Shahi walls. Behind it lies open farmland, rich well watered black earth where bullocks plough fields edged in palm groves and mango and guava orchards. There are no high rises, and from the roof of Ibrahim's tomb, the screen of trees shuts out the cars and roads and new villas, returning you instantly to the world of the Bijapur miniatures: of domes and palms and soaring palaces; of the Jama Masjid and the shrines of Bijapur's many Sayyad Sadaths and AwliyaALLAH. All around the city fragments of this old courtly world survive almost completely intact, yet nowhere more so than at the shrine of Hazrath Khwaja Ameen Uddin Chisty (RA). "We never have any trouble. We think all Gods are the same. Hazrath Khwaja Ameen Uddin Ali Chisty (RA) did not just welcome the Muslims but welcomes everyone." "There is one God only," agreed his wife. "We are friends with our Muslim brothers and we have faith in their saint. Most of the pilgrims who come here are Hindu." "We try to keep up this tradition," said one of the shrine's Muslim guardians who had walked up and was listening to what the woman had said. "As in the day of the Hazrath Khwaja Ameen Uddin Chisty (RA), no one is turned away but welcomes everyone. This has always been the tradition of this city." 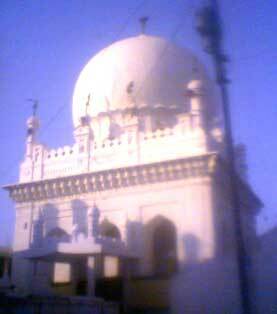 About Bijapur Shareef: - Bijapur is a district headquarters of the Bijapur District in the state of Karnataka. It is well known for the great architectures of historical importance built during the Adil Shahi dynasty. The city is located 530 km northwest of Bangalore and 550 km from Mumbai (Maharashtra). Bijapur is best known for its magnificent Gol Gumbaz' which is the second largest dome in the world and other historical buildings, including the Jamiya Masjid, which has been called one of the first mosques in India. This ancient town was first settled in the 11th century by the Chalukyan dynasty and later rose to prominence as the capital of the Adil Shahi dynasty. Today, it is an important tourist destination in Karnataka with its smorgasbord of places of historical, cultural and architectural interests. Allah aur Rasool-e-Kareem, Sal-lal-lahu Alaihi Wa Sallam aur Hazrath Khwaja Ameen Uddin Ali Chisty (Rahmathullah Allaih ) almaroof A'la Sher-e-Khuda ( RA) may do khass Nazar e Karam on you and your family and your beloved ones. Ameen. Ameen. Ya Rabbil A'lameen. Shahenshah of Deccan Hazrat Sydena Hashim Peer Dastageer R.A., in Bijapur , Karnatak. Bijapur (Karnataka): Ibrahim Rauza,tomb of Ibrahim Adil Shah. PARVEEN Travels has combined with TicketGoose.com, it is providing better service than other travels, like these travels had entertinement facility, so you don't fell bore at all, i am sure you can enjoy the journey with PARVEEN Travels. Ticketgoose is trusted brand in Online Bus Reservation since 2007. Ticketgoose.com Launched in August 2007 has been a leader in Ticketing Web Portal for Book Bus Tickets Online.They operate over 3000 Destinations in South India and have collaboration with more than 250 Travel Agents.